I have had a chance to visit all the classes this week. It has been an absolute pleasure seeing all of the creative and interesting ways that the teachers are helping your children to learn. Please ask your children about what they have been learning this week. I am sure you will be impressed! 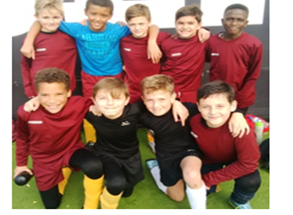 The Year 5 and 6 boys’ football team had a great day at the Borough football tournament this week. They won an award for team work and won 2 of their games. Well done, boys! As a school, we raised an amazing £1048.22 for the NSPCC. We had a special assembly yesterday to celebrate. Thank you so much to everyone who supported this deserving cause. Last Friday, Reception class had a slumber party, to help them understand the ‘Night and Day’ aspect of their topic. 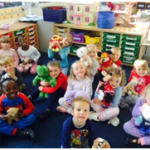 They had lots of fun singing lullabies to their teddies! Please note: there will be no swimming next week. 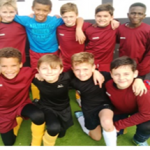 Don’t forget to sign up for half term activities with our coach, Del Holloway, to be held at Holly Trees Primary School in Brentwood. Please see the website (under newsletters) for more details. It is not too late to return your questionnaires (remembering that 1 is strongly agree and 5 is strongly disagree). I will analyse the results over half term and let you know the outcome. We have had more than one nomination for this important role, so there will be an election. Ballot papers will be given out early next week. Parents should meet us at the church for a 9.30 start next Thursday, 22nd October. If you are coming to the church, please bring your harvest gifts (biscuits/tins etc…) with you, to save the children carrying them. We will register the children in school at normal time and walk them up. We hope you can join us. Overall attendance in Years 1-6 has improved this week and we exceeded the target of 97% overall, which is good news. Class 1 and 2: 96.67%; Class 3 and 4: 98.62%; Class 5 and 6 98%. Keep it up, everyone! Kai Davis, Fae Dignum, Naa dedei Osaji-Okai, Brooke Thorn, Ellie Allen-Moss, Zachary Teshola, Imogen Snell and Hermione McCormac. Work of the Week ! Class 5 and 6 ‘Work of the week’ certificates went to Kaci Peart, for excellent, well presented Maths work and Bradley Allen-Guinane for very effective editing of his writing. Well done to Charlotte Woods, Mojola Awosan, Joe Stanley, George Dignum (x2), Aimee Bradley, Elena Marshall, Zachary Teshola for earning their place in the Gold Book. They have all displayed excellent learning behaviour. This week’s Headteacher’s award went to Kaci Peart, for living up to our school motto : ‘The best that I can be’.